When Julie Qiu, of In a Half Shell does something with oysters, it's done right. 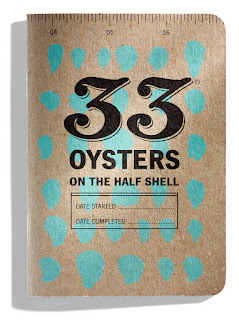 And when she teamed up with 33 Books Co., together they perfected the pocket-sized oyster journal. Understanding oysters isn't very different from understanding scotch, or wine, or beer. Each are complex in their own way. Oysters grown in different locations will taste differently. The shapes will be different. Flavors can range from buttery to briney, seaweed, nutty and more. Textures can differ as well. I like my oysters firm and crunchy. Some prefer a creamy texture. Oysters are grown and farmed in some of our most beautiful waters where oysters contribute to improving water quality and oyster reefs provide habitat for many fish species. The oyster is a complex species. This journal provides a framework for thinking about and understanding the different oysters you eat. And later you have the journal to recall your experiences. This journal is done well and will be delightfully enjoyed by all those who use it. Buy one for yourself and consider buying a few to share. They could make the perfect party favor for your next oyster party! Purchase some today for just $5.00 each online here. Need some ideas on where to eat oysters in your area? Try this City Guide.